Produced by Steve n’ Rick. He’s back, the man behind the mask. OK, it’s been close to twenty years since that release, but Alice Cooper is back with the classic eyeliner, classic sound and his best CD in a decade. Picking up where The Eyes left off, Cooper is rocking as hard as ever with his tongue firmly in cheek. In fact I found myself laughing out loud to the sensational “Desperado” clone “The Saga Of Jesse Jane”. Whereas the character in “Desperado” was your typical gunslinger, Jesse Jane is a cross-dressing outlaw. Lyrics such as “are you just an average Joe, looking for a fashion show” are priceless. From the opening three chord strut of “Woman Of Mass Distraction” to the closing swamp swing of “Zombie Dance” (I’m ignoring the rap-crap bonus track “Stand”, because certain releases luckily won’t include it), Dirty Diamonds offers up a varied and satisfying listening experience. In the late 60s Alice attempted a Beatles sound with horrifying results, but he nails it on “Perfect” – a song about an incredibly vain woman. “You Make Me Wanna” and “Sunset Babies” sound like lost classics from the Love It To Death era – and the later has such an infectious chorus it screams rock radio single. 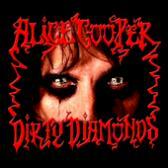 “Pretty Ballerina” is one of those weird quirky songs that only Alice Cooper would unearth and cover. “Run Down The Devil” is a dark rocker in which Cooper “goes to hell” to face Beelzebub, while “Steal That Car” is a simplistic straight-up rock song. The title track would make a great live show opener. It is the hardest Alice has rocked since the Raise Your Fist And Yell days (excluding the ill-fated nu-metal phase) and includes some of the best sounding bass drums I’ve heard in years. This tune was created to be cranked in an automobile, and that’s why my ears are still ringing. Reviewed by Skid for Sleaze Roxx, July 2005.